465 Blossom Ridge Road, Shepherdsville, KY 40165. This was a great home that sold in less than 90 days. Contact the Hollinden Team to see how we can get your home sold. When I think about this house for sale in Blossom Ridge Estates in Shepherdsville, Kentucky, I’m overwhelmed with feelings of relaxation. If you lived in this gorgeous home you’d never have to leave home for a vacation. The name of the road alone whispers peace and tranquility. 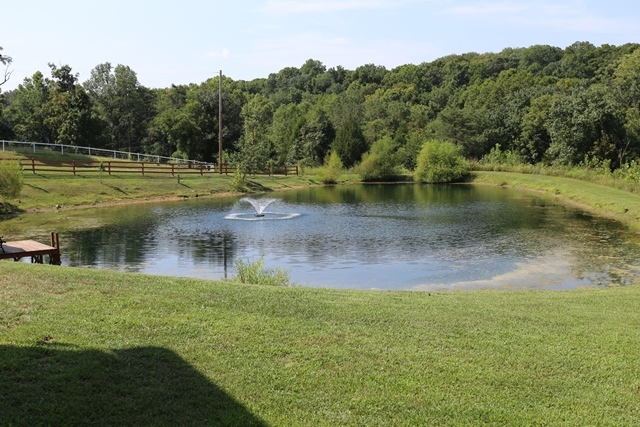 If you’re the adventuresome type, there is 5 acres with some woods to allow for loads of fun on your ATV or, fish in your pond stocked with bass, catfish and bluegill. It also features a nice fountain and covered dock. The sellers have done a lot of improvements to the home since they’ve owned it, to make it an oasis away from the hectic world that we live. The roof was replaced in 2013. Let’s go inside and talk about this spectacular house. Click on the video link below to see some of the many wonderful amenities offered with this brick home. To sum up the video: It has 5 spacious bedrooms and 5 full baths. This home boasts beautiful hardwood floors throughout. The Spacious Master Suite is "Sweet" to say the least. Bring all your king size furniture. Escape to the master bath with double vanities, a makeup table, a relaxing whirlpool tub and a walk-in shower with jets and overhead rain shower head. Where to start on this masterpiece of a kitchen with lovely solid cherry cabinetry, top of the line Jenn-Air and LG appliances, solid surface counters and breakfast bar. No need to buy an extra TV for the kitchen because this refrigerator has one in the door. Cool!!! The Professionally finished lower level has it all too. There is room for all of your entertainment needs as well as a full kitchenette and a full bath. The media area has surround sound to make you feel like your at the movie theater. All of this conveniently located just South of Louisville on I-65. If you do decide to venture out. It's just a hop skip and a jump to Louisville for work or pleasure. Call Tim Hollinden today at 502-429-3866 to view this beautiful property. Or, if you would like to look at other Homes for sale in Bullitt County from $300,000 to $400,000. Steve can help you with those as well.